【ULTIMATE SURVIVAL GEAR】 The survival bracelets combine Oil Filled Compass, Loud Whistle, Sawtooth Scraper, Flint Fire Starter, and Parachute Cord, it is the ideal gift for every camping, hiking, hunting, boating, fishing enthusiast or simply anyone who likes going in the Great Outdoors and be prepared! 【COMPACT PORTABLE SET】The paracord bracelets are provided with the easiest and most versatile clipping buckles, they will help when you are in an emergency situation or with poor visibility. The slightly arc shaped slim buckles provide comfortably wearing on your wrist, you can enjoy having a tactical survival kit always with you, no matter where your adventure takes you! 【HEAVY DUTY RELIABLE】The seven-strand military grade paracord can spread up to to 10.5 feet (3.2 meter) long and have been tested for 550LB in any situation, the bracelet will hold on through all the adventures you want to experience.It is waterproof and made of anti-corrosive material. Easy to wash! Just use soap and water. 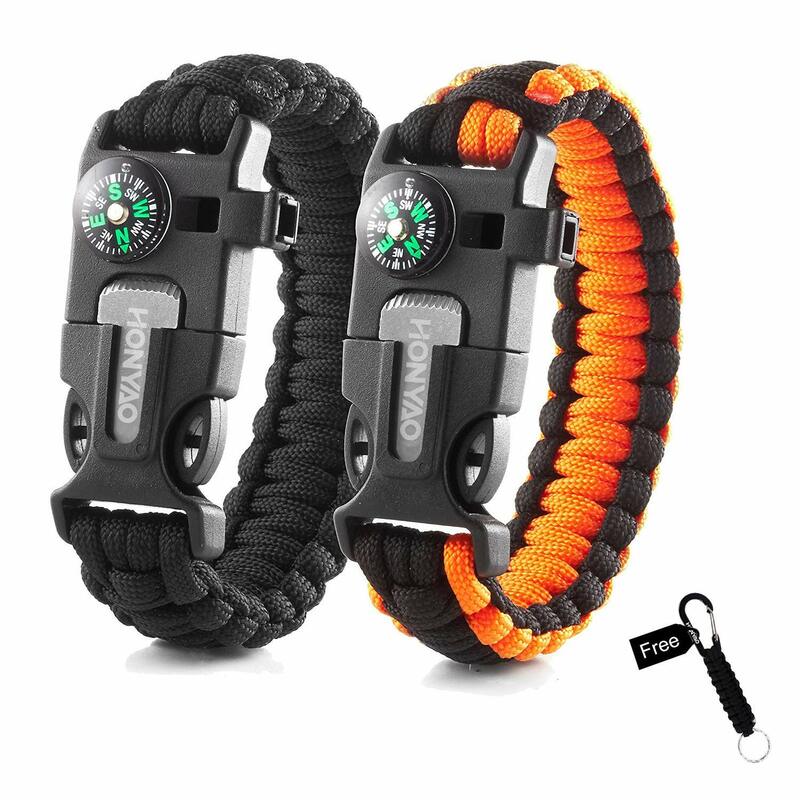 【BE SURPRISED AND SATISFACTORY】You will get 2 PCS Paracord Survival Bracelets and time limit bonus (1x 6.3 inch Paracord Keychain), Extended 60-day worry-free money back, 24 months warranty, and 24x7 friently customer support. *REMINDER* The total length of the bracelet is 9 inch, make sure the wrist size is between 6.3-8inch before you add to basket.